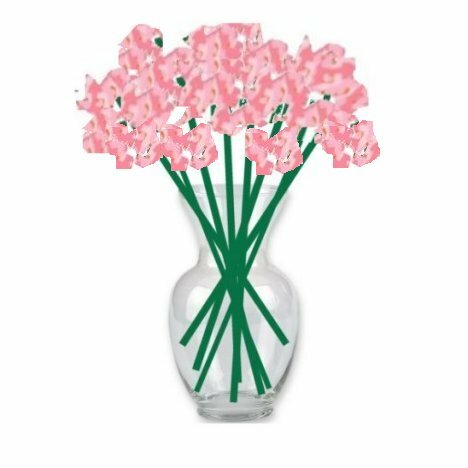 If you are using "filler flowers" (usually tiny flowers such as wax flower, babies breath, statice, limonium), insert them randomly in open spots in the design. 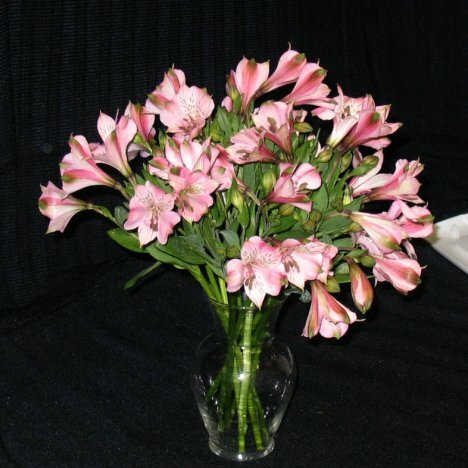 Since I am demonstrating with only alstromeria, you can see that I don't have a pattern of different flower varieties. 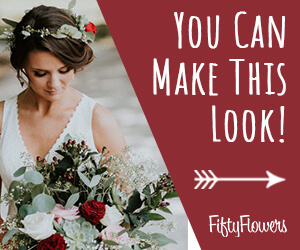 By now, the flowers should have a nice, rounded top, all the stems are interlocked and the bouquet looks good from all sides (including the top). 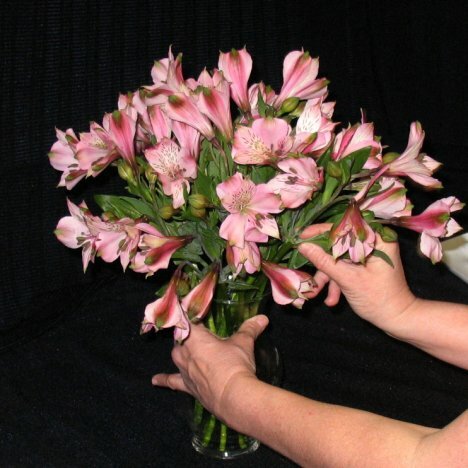 Alstroemeria (also known as Peruvian Lilies) have graceful heads that curve out beautifully to the sides on the bouquet. 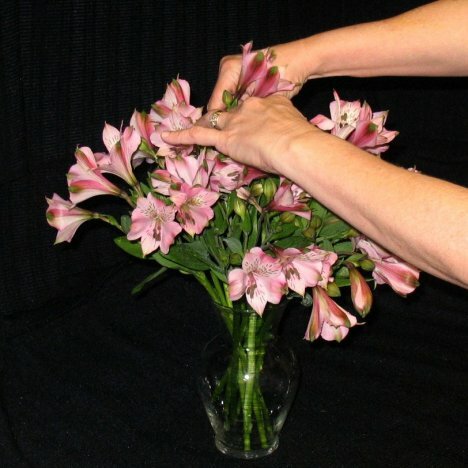 Keep in mind if you use tulips that they KEEP GROWING in the vase. You may have to cut them down a little more. The flower head will turn toward light or sun if you are not keeping the finished flowers in a darkened room away from sunlight. Here's a general view from the top. This is not depicted as tightly clustered, but I wanted you to see the flower stems. 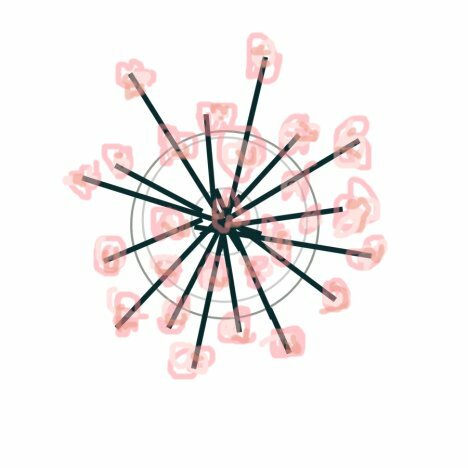 The grid may be so tight at this point that you have to gently "work" the flower into place, using your thumb and index finger right above the tie point in order to get all the flowers in. You can mix in greenery scattered across the flowers if you desire that look. This design will finish with a frame of flowers around the sides. 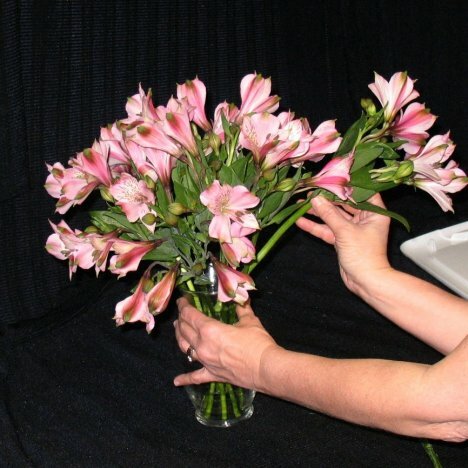 Once you are happy with the look and shape of the bouquet, you are ready to tie the flowers off.